Public profiles on “How did you contribute to OSM?” : Neis One! Anyway, after the last modification, which required the mentioned user login on HDYC, I got positive and also negative feedback. Most negative feedback concerned that profiles are now hidden and not public anymore. But because contributors want to show their mapping efforts, I implemented a new feature, that profiles can be accessed without a user login on HDYC. So, if you want that anyone can access and see your OSM profile, just add a link to your HDYC profile on your OSM profile page. Similar as you did this maybe already for your OSM-related accounts (see blog post). 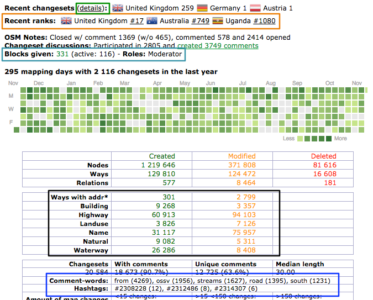 The tool-chain checks the profiles of every contributor, who has been active within the last 24 hours. Additionally, the HDYC web page got several small updates. The overall ranking has been switched to more meaningful recent country rankings. The “last modifier of” amounts have been temporary removed/replaced by detailed numbers of created and modified way elements. The changeset table now also contains some really useful hints about used words in the changesets comments and hashtags and their amounts. This feature has been requested by a German contributor, thanks “!i!”. Most of the displayed numbers should be updated on an hourly basis. 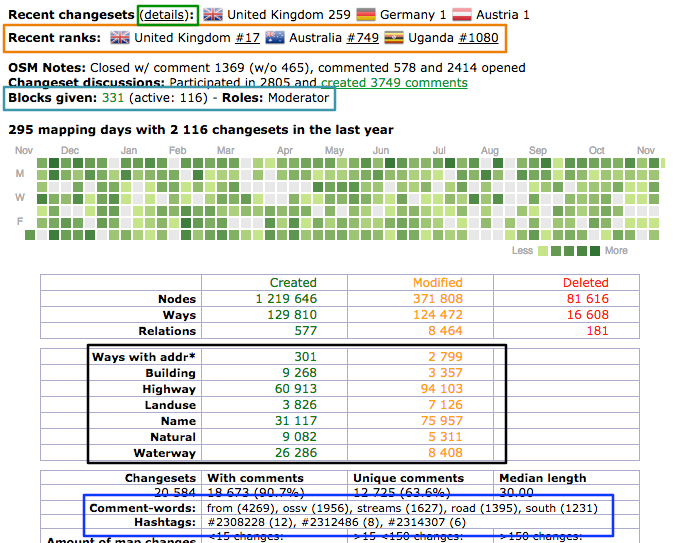 Only the activity areas and information about changesets are “only” updated every 24 hours. Some numbers also contain links to further statistics such as detailed information about recent changesets, ranking lists of a country and commented or discussed changesets. Overall I tried to highlight further efforts and activities, such changeset discussions, related accounts or roles, and not “only” raw mapping element amounts. Moar updates for unmapped places (at least once a month), please. On topic, where it says “5 discussed”, I wonder if it would be clearer if it said “5 with comments”? One may think that they have commented in 5 changesets overall, whether or not it is theirs. Not sure if this is part of the most recent changes but you switched from showing the first and last *change* to first and last *changeset* – which for me is not so cute since my first changeset happens to be empty for some reason. Thanks for the explanation and the opt-in. I really miss the overall ranks of nodes/ways/relations though. It’s the closest thing to an objective ranking of how crazy a mapper you are that I’ve seen. several days ago I’ve put link to my hdyc profile into my profile page on osm.org. Hi Marián, thank you very much for noticing. There was a bug with special chars. Should be fixed now. 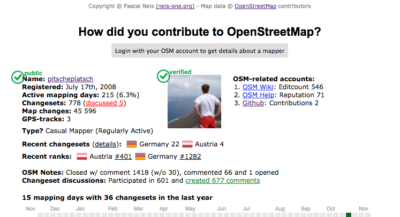 Your profile will be updated within 24h after your next OSM contribution. why is openstreetcam not counted inn, but Mapillary is ? I guess there was something wrong this morning during the update. Now your profile contains the OpenStreetCam account. As many times before: Thanks for HDYC!